A limited number of uncirculated copies of this rare, out-of-print book have been discovered. 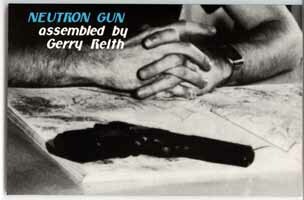 Neutron Gun also featuring works by Bob Black, Carly Sommerstein, Gregor Tomc, Ed Lawrence, T.M. Caldwell, Sun Tsu. Cover by Freddie Baer. Add $3.50 U.S./per copy for orders shipped outside U.S. No C.O.D.